1) Well. A lot has been happening in the two weeks since the last This Week at Amtrak was published. Before we get into some specifics, we first need to hear what Minnesota Association of Rail Passengers and United Rail Passenger Alliance Vice President of Law and Policy Andrew Selden has to say on the current state of Amtrak. Amtrak blinds itself, in its endless posturing to fool its bankers in Congress, by measuring its performance by numbers that do not really matter, while ignoring or burying numbers that do matter. As a result, it makes decisions, including strategically important allocations of precious investment capital, on the basis of fundamentally misleading data. The most glaring example is Amtrak's endless blathering about "ridership." Ridership is only a measure of a sale transaction. It does not differentiate among the size of the sales. One "rider" from New Haven to Boston is, by this yardstick, exactly equal to one rider from Washington, D.C. to Boston, or even Los Angeles to Boston. Amtrak makes this worse by blurring useful sales data (ticket prices) into averages by which they measure (actually, it's just arithmetic, not really "measuring" anything) "yield," which is the average revenue per passenger mile on a train or route. This tends to reinforce the false belief any one passenger is pretty much the same as any other. In an urban transit system where every passenger pays the same fare, that might be okay. But on Amtrak, where a typical "corridor" customer might pay $10 to $30, but a family in a sleeper to the west coast could be paying $1,000 or more, these "riders" are decidedly unequal. Fifty of the former are less than two of the latter. But Amtrak is obsessively focused on "ridership." A yardstick Amtrak tries to hide, and apparently never uses to make important resource allocation decisions, is load factor. Load factor is the percentage of your inventory you are able to sell. Airlines live and breathe load factor. Load factor is available seat miles (total inventory) divided by revenue passenger miles (seat-miles sold to paying passengers). Load factor ("LF") matters greatly. Among other things it is a perfect measure of capital efficiency, and where a business is over-invested vs. under-invested. It is an indirect measure of opportunity cost. A trend analysis of LF is a tell-tale for a growing or a dying business. It indicates whether an operation has achieved an efficiency of scale, or needs to ramp up, or down, its application of capital assets to achieve an efficiency of scale. The NEC's low load factors show Amtrak is already over-invested there: it offers much more inventory than it can sell for $30, or even give away. Long distance trains, with high load factors, show where Amtrak is under-invested, turning away potential $1,000 customers by the hundreds. Simple "ridership," without consideration of load factor, is classic "Amtrak accounting" that disregards the cost and utilization of capital. If you have a rich uncle who doesn't care, or a politically-oriented appropriations committee that has other objectives, or a gullible state agency that doesn't seem to get it (a la Oklahoma and the Heartland Flyer), then one can disregard capital costs, load factor, and utilization. Ready access to "free" capital (but always with a heavy political and opportunity cost) obscures that. Suppose a train or route has a LF of 40% (NEC average is about 40%). Suppose the LF is static, or even growing slowly. Is that a good thing? Or does that suggest the capital – represented here by the rolling stock, the overheads and even the relationship and rent costs with the host railroad – might be better applied elsewhere? In other words: Can those trainsets produce, or earn, even more someplace else? Real world, actual example: take a standard KFC restaurant with 72 seats grossing a million a year, and is often "full" (i.e., has a very high LF). It is a cash cow. The owner is happy. His banker is happy. But an investment banker focused on returns on capital (i.e., making money by maximizing output) will say, "Bulldoze this obsolete, underperforming asset. Get rid of it. It is a parasite. It is an obstacle to growth and profit. In its place, build a new, larger KFC with 150 seats and a bigger kitchen and a drive-through, that is physically capable of growing into a TWO or even three million a year store." And if the KFC instead were a lightly-used 40-seater that was doing $500,000 a year and showing no real growth, even if it were steadily profitable at that level, any rational analysis would conclude the store should be closed outright, and maybe re-located across town by the Wal-Mart, or out by the interstate. LF as well as cash flow, market share, and earnings are all part of the constant analysis that should be done of any commercial activity. Amtrak NEVER does that. Amtrak instead fools itself and fools its bankers in Congress and its client state governments with phony-baloney data about transaction volumes ("ridership") and other irrelevancies. ITEM: Amtrak's net loss last year was UP from the year before, for the umpteenth year in a row, even after all the subsidy and the deferred maintenance and the shrunken fleet and all the other voodoo accounting. That is why Amtrak is still a sinking ship, and why Interim President and CEO Joe Boardman, just like his several predecessors, is no different from Captain Edward Smith of the White Star Line. And trains like the Harrisburg – Philadelphia locals, or Acela, or the Heartland Flyer, with their low load factor, whatever the ridership, are just like that tiny scrape in the hull that eventually worked its disproportionate magic on the fortunes of the RMS Titanic. 2) Amtrak issued another route renewal report, and issued a final report on a second route. The Pioneer route report, which was commented on previously in this space, was issued in a final form with no real changes in how Amtrak perceives to put this train between Denver and Seattle back into service at extremely high costs and a too long lead time, despite questioning from two United States Senators along the route, Senator Crapo of Idaho, and Senator Wyden of Oregon. The new report issued was for restoration of the North Coast Hiawatha (Originally, the North Coast Limited, pre-Amtrak.) over the original Northern Pacific Railroad tracks. This route will parallel the Empire Builder route, but make a more southerly trip. Pre-Amtrak, the Empire Builder and the North Coast Limited were strong rivals between Chicago and Seattle, and both routes have breath-taking mountain scenery. The North Coast Hiawatha was one of the trains massacred by the route cuts of the Carter Administration. Amtrak wants – yes, we’re not kidding – over one billion dollars to restore this route, with the bulk of the money going to track upgrades. After the Burlington, Northern Pacific, and Great Northern railroads were all folded into one company (which eventually became BNSF when the Santa Fe was added to the mix), the Northern Pacific route was considered redundant to the Great Northern (Empire Builder) route, and was downgraded. Part of the route in Montana was sold to a short line operator, too. All of that aside, Amtrak has come out with ridiculously high figures for route restoration, including an amazing $330,000,000 just for six trainset of new equipment, including locomotives. This works out to an astounding $4,500,000 per piece of equipment, which is not only impossible to justify, but incredible anyone could present this figure with a straight face. Additionally, Amtrak demands millions and millions of dollars for crew training, as it has done in previous reports. This analysis of the North Coast Hiawatha landed in the This Week at Amtrak mailbox. On October 16, 2009, Amtrak published the North Coast Hiawatha Passenger Rail Study as required by the Passenger Rail Investment and Improvement Act of 2008 (PRIIA). That law required Amtrak to produce a report within one year of October 16, 2008 examining the feasibility of restoring passenger rail service between Chicago and Seattle via the former Northern Pacific mainline in Southern Montana. Confronted with a political environment favorable to the expansion of its services, the report suggests an institution whose marketing and innovative instincts have atrophied. The report’s tone reflects a determination to drag out the timeline and extract as many subsidies as possible rather than seriously consider how a successful passenger rail service in the study area can be implemented. Below are specific areas the report is insufficient or raises serious concerns. Amtrak penalizes the study train for diverted passengers from other trains, but does not credit it for passengers fed to other trains. This analysis is incomplete for two reasons. First, the Empire Builder is often sold out for being over capacity, so an additional train may have the net impact of freeing up space on that train to be sold to others, wiping out any revenue loss. Second, and more importantly, Amtrak does not estimate additional revenue for other trains from the addition of the North Coast Hiawatha (or if they do, they don’t report it). Few Amtrak long-distance passengers ride end-to-end, with many taking shorter trips often involving transfers to other trains. On the west end is the Seattle-Portland Cascade train as well as the long-distance Coast Starlight to California. On the east end are services to St. Louis, New Orleans, Washington, Boston, New York, and Michigan. Added service into and out of Seattle and Chicago will result in additional revenues for all of these trains. If Amtrak “penalizes” the North Coast Hiawatha for “diverting” passenger revenue from trains, it should also “credit” the North Coast Hiawatha for “feeding” passenger revenue to other trains. One approach Amtrak did not take would be to estimate system-wide revenues and expenses from the addition of the North Coast Hiawatha. This would give a true picture of the actual incremental cost of service expansion. Amtrak is also studying the expansion of services in several other routes, and is producing piecemeal reports on financial impacts, one-by-one. As Amtrak adds trains and frequencies, the additional options stimulate demand beyond that of one-train-on-one-corridor. A comprehensive approach of these proposals would be necessary for informed decision-making. Amtrak’s long-distance service requires subsidies to cover its operating shortfalls [Based on Amtrak accounting methods]. Few if any recover 68.8% of their costs for all expenses, or actually break even on variable expenses, as Amtrak estimates here. Why Amtrak buries this information is inexplicable. One possibility would be that acknowledging Amtrak will run a train with a rather positive financial performance undermines its argument that massive subsidies are required to operate it. Note: Amtrak does not clarify whether its estimate of system and route costs are the amounts that will be assigned to the North Coast Hiawatha or whether they are incremental costs of adding the train. For example, assume (using made-up numbers) Amtrak spends $100,000 a year operating the existing station at Fargo, North Dakota (which the North Coast Hiawatha would stop at), and $5 million a year running its existing national reservation system. Assume also Amtrak’s cost estimates in the report include line-items of $50,000 for the Fargo station and $200,000 for system reservations (they don’t; those items are not broken out). Does that mean Amtrak is spending an additional $250,000 when the North Coast Hiawatha is launched, or rather the North Coast Hiawatha will be assigned $250,000 of existing costs? If the latter, it is relevant information, but its inclusion warps the decision-making process. Among Amtrak’s costs of operating the North Coast Hiawatha would be costs Amtrak is already incurring, and will incur whether the route is launched or not. To use economics terms, a decision-maker would be erroneously looking at average cost instead of marginal cost. If it is the former, Amtrak needs to justify the $27 million in route and system expenses beyond merely saying they are “other direct expenses.” The amount reflects a third of the expenses associated with running the train, and while not suspect on its face, it does raise questions. Why does Amtrak’s report not include a technical appendix itemizing the costs it has estimated? Unlike here, Amtrak’s past studies have often included a series of operating options. The recent Pioneer Service Study looked at several different alignments, the Sunset Limited Service Study looked at different service options, and the Ohio Service Study looked at different frequency options. Here, however, Amtrak provides no option other than one single, slow, short train. Given Amtrak’s own ridership and cost estimates, this is indefensible. It also allows Amtrak to demand higher subsidies than would be required to operate the North Coast Hiawatha. The report recommends the establishment of one round trip a day along the 2,300 mile route on a 49 hour schedule, for an average speed of 47 M.P.H. (The North Coast Limited in 1956 managed 46.5 hours, so Amtrak proposes a train slower than one run 50 years ago.). The train would consist of locomotives, a baggage car, a crew car, two sleeping cars, three coaches, a dining car, and a lounge. Since each sleeping car has a maximum capacity of 49 and each coach has a maximum capacity of 74, that would mean a total train capacity of 320. On page 28, Amtrak estimates even this slow, single train will result in 359,800 passengers a year, or 492 per train. On the face of it, this suggests the train will fill 153% of its capacity. Of course, few passengers will ride end-to-end, resulting in turnover en route. It would be useful to know Amtrak’s estimate of passenger-miles or load factor, but the report does not provide those numbers. Even if each seat turns over once per trip, the load factor would still be 76% (which would make airlines envious). Amtrak’s report handicaps itself by limiting the train’s capacity. Many of a train’s expenses are fixed (engineer and conductor costs, for instance) or grow only minimally (fuel and service attendant costs, for instance) with additional cars. In the past, American passenger trains have operated with 16 to 22 cars (Today, in Canada, the Canadian transcontinental often operates with 22 cars in high season). The only serious limiting factor on train lengths are station platform lengths and locomotive power (itself limited based on the route’s curves and grades) and the ability to transmit hotel power from the locomotive to the rest of the train; usually 18 cars in the United States is the maximum train length because of this. Amtrak provides no information on why it limits the North Coast Hiawatha to nine cars (with only five being revenue cars) other than it lacks the imagination to try for more. Since Amtrak’s proposed train already has locomotives, a baggage car, a crew car, dining car, and lounge, any additional cars would be revenue cars generating sleeping or coach ticket revenue. A 14-car train, for instance, would double the North Coast Hiawatha’s capacity, potentially doubling its revenue and most certainly not doubling its costs. Given Amtrak’s ridership estimates, such a capacity expansion would be justifiable. Amtrak does not investigate this option. Amtrak also does not investigate the option of greater frequencies or runs over segments of the route (aside from noting that Washington State would not object to running trains to Minneapolis instead of all the way to Chicago). As Amtrak has discovered with service in California and Illinois, additional trains each day can reduce subsidies because (1) added frequencies can mean equipment spends less time idle at each end and (2) added frequencies can increase revenue from additional riders taking advantage of more options. A second frequency 12-hours off of the proposed schedule would be a natural consideration, as would additional day-train frequencies between segments of the route. It is unfortunate Amtrak looks at additional frequencies not as expanding passengers options and thus revenue, but rather as something to be penalized for “cannibalizing” passengers and revenue from existing trains. Most transportation providers offer travelers options. One of Amtrak’s largest weaknesses is many of its trains run only once per day, resulting in equipment sitting idle for 6-18 hours at each end and passengers giving up if they cannot work with Amtrak’s one timetable option. Twice the trains can in many cases result in more than twice as many passengers. Fixed route costs, such as station operating costs (here estimated to be $27.1 million), can also be spread over more trains. As noted above, Amtrak estimates that the train’s operation itself, exclusive of system and route costs, will break even. Amtrak’s report also provides no discussion of service options or marketing opportunities. The report mentions the North Coast Hiawatha’s Livingstone station is not far from Yellowstone National Park, but does not enlighten the reader as to whether Amtrak will capitalize on that beyond leaving passengers at Livingstone. (In the past, the Northern Pacific Railroad ran shuttle trains and later shuttle buses to the park.) The private Grand Canyon Railway in Arizona offers four different accommodation options, including a basic coach seat option. The higher-priced options include snacks, entertainment, and Grand Canyon National Park admission. In Europe, the CityNightLine overnight train service offers several different accommodation options, with higher-priced options including welcome wine or beer, an array of magazines, and breakfast on arrival. Other Amtrak trains have included parlor lounges, observation cars, children’s playrooms, quiet cars, wine tastings, and enroute tour guides. Other ideas could include on-board treadmills or weight equipment, video arcades, taverns or bars, or gift shops. Amtrak’s report shows no creative thinking with regard to providing services to passengers, an important aspect of its operation. This is particularly indefensible in that Amtrak requires the purchase of brand-new railcars to launch the service, and estimates it will take 4-5 years to begin operations after funding becomes available. If Amtrak needs five years and new trainsets to provide exactly what it has provided for years on other routes, it is not thinking sufficiently creatively. Amtrak’s report also provides no discussion of joint marketing opportunities for other popular attractions along the route, including the Mall of America in Minneapolis; historic tourist attractions in Butte, Montana (a larger town which Amtrak inexplicably writes off without bothering to estimate the costs of serving it despite rails existing and being on the train’s route, even though it reports that public and Montana Department of Transportation comments strongly favored studying operating service via Butte) and Bozeman, Montana; airports; and small-town communities currently without rail service in Washington State. Throughout the report and its actions in recent history, Amtrak views its role as merely common-carrier transportation handling passengers when they show up. Instead, Amtrak should push itself to figure out how it can develop a market, providing a travel experience. Doing so will improve the bottom line for the company and for taxpayers, but requires shaking Amtrak out of its apathy and atrophy. 1. What is Amtrak’s estimate of the load factor for the North Coast Hiawatha, and how many passenger-miles will it generate? 2. What are the system-wide and marginal revenues and costs associated with launching the North Coast Hiawatha, including additional revenues to other trains from its operation? 3. How many of the cost items within Amtrak’s estimated $74.1 million in estimated North Coast Hiawatha operating expenses will be incurred whether or not the train route is launched? 4. What are the revenue and costs associated with other operating options, such as a longer train of 14-22 cars, or additional frequencies? 5. What additional level of capital investment would be required to raise average operating speed to 55 M.P.H. (42 hour schedule), 65 M.P.H. (36 hour schedule), or 75 M.P.H. (31 hour schedule)? 6. Given that Amtrak will be purchasing new equipment for these trains, what innovative ideas will Amtrak explore for the equipment? 7. What marketing opportunities will Amtrak explore for the operation of the trains, to maximize passenger travel experience and develop the market? 8. What are the costs associated with operating via Butte, Montana? 9. How would a system-wide expansion of train lengths and frequencies for long-distance trains change the operating performance of this route? 10. Why does Amtrak estimate so many people will ride the North Coast Hiawatha, relative to other long-distance trains? Joseph Henchman lives in Arlington, Virginia, and is interested in transportation economics and rail planning. He works as an attorney and policy analyst with a non-profit think tank in Washington, D.C., but this report is not associated with that organization. His email address is jdhenchman [at] yahoo.com. 3) Amtrak has now issued four reports since the end of the summer. First, the Sunset Limited – East of New Orleans/Gulf Coast report (Amtrak doesn’t want to run the service); the Ohio 3-C report for restored service between Cleveland, Columbus, and Cincinnati (Amtrak doesn’t want to run the service), the Pioneer report for restored service between Denver and Seattle (Amtrak doesn’t want to run the service), and, finally, the North Coast Hiawatha restored service report (Amtrak doesn’t want to run that service, either). When you add up Amtrak’s estimates to restart these four routes, it’s over $2,000,000,000 (that’s two billion dollars, if you don’t want to count zeros). In reality, if Amtrak really wanted to do any of these projects, the estimates are probably high by at least 40%, if not a full 50%. But, when you’re a planner for a quasi-governmental agency and you’re accustomed to spending someone else’s money (That would be money which belongs to you, the taxpayer. ), costs don’t really matter. What matters is convenience and lots of bells and whistles (No pun intended.). Amtrak’s dream world dictates all new equipment, extravagant stations where smaller ones will do, crew training costs which are incomprehensible to any railroad professional, and a gold-plating of railroad infrastructure “just in case” the railroads want their entire right-of-way wish lists fulfilled at someone else’s expense. All of this leads to the inescapable, sad conclusion that until Amtrak has a new management team which has any inkling of a vision for the future which includes new passenger car orders, a business plan based on reality instead of only raiding government treasuries, or without fantasies of ignoring the conventional passenger rail business because of the glamour of an incorrect assumption Amtrak will be the exclusive high speed rail operator (there’s a thought to give you nightmares for a week), restored long routes such as the North Coast Hiawatha may not be the best plan. As presented, Amtrak’s four route restoration plans are a prescription for disaster. The Gulf Coast report laments Amtrak went to all of the trouble of studying multiple scenarios, and settled on four, all of which Amtrak has priced too high. The reality of the Gulf Coast report is if Amtrak simply extends the City of New Orleans from New Orleans to Orlando, Amtrak will instantly reestablish a Chicago-Florida train, restore service on the Gulf Coast, and have a powerhouse operation for the cost of one extra trainset for the City of New Orleans (due to current too long equipment layovers in New Orleans) and the cost of Positive Train Control installation on the CSX line between New Orleans and Jacksonville. The Pioneer report wants to set up a separate operation for the Pioneer between Denver and Seattle, with through-cars on the back of the California Zephyr between Chicago and Denver. Amtrak never considered the huge benefit of running a second frequency in the form of the Pioneer between Chicago and Denver, apparently because it would be too much trouble, no matter how much of a financial gain would be found. The Ohio report wants to set up a pretty good service, but with a lousy end point in Cincinnati so the service will not connect withe the Cardinal; Amtrak continues its reckless policy of not often enough offering connecting trains just in case some passengers may want to travel on more than one route to reach a final destination. None of the reports take into account the matrix effect of connectivity, more travel choices, or more stations served. Amtrak can only see costs, instead of benefits. Little of Amtrak’s work reflects it was created by anyone with real concepts of passenger service, what’s overall best for passengers, or what posture best serves Amtrak – and, our country – financially. For right now, until some of this changes, Amtrak may best serve itself and all of us by making some logical, small steps which will strengthen the company financially. Things like Kansas City-Omaha, Oklahoma City-Kansas City, Peoria-St. Louis, Savannah-Jacksonville, or Barstow-Bakersfield (/San Jose). Maybe think about Harrisburg-Newark via the Lehigh Valley. Even easier would be to add truly new Superliner capacity to the existing long distance trains, to start to capture many of those $1,000 tickets Amtrak is losing now because the sleepers are full at various peak load points. For those hoping for restoration of routes which never should have went away, this fall is truly a season of discontent. Amtrak seems to have gone out of its way to make things as difficult as possible for any returning trains, yet its chairman of the board and some senior executives are making presentations around the country about how Amtrak is the perfect organization to be the exclusive high speed rail operator for new services in America. Until Amtrak gets its house in order and demonstrates it has some – any! – vision, no one (even government bureaucrats) are going to be foolish enough to anoint Amtrak as the high speed rail operator. 4) Last Saturday, October 17, 2009, a determined band of people met together here in Jacksonville, Florida. The group named itself the Sunset Marketing and Revitalization Team, and has been meeting for over a year now at various locations along the former transcontinental route of the Sunset, prior to its unceremonious loss of the east end of the route beyond New Orleans due to Hurricane Katrina in 2005. John Sita, Jr. of New Orleans is chairman of the SMART group, and Jerry Sullivan of Jacksonville was the gracious host of the meeting. Without getting into the various discussions and deliberations the group had, what is notable is the very need for the existence of this group. This group has no formal sponsorship, and is completely self-funded. These people banded together because they feel their quasi-governmental national passenger rail carrier has failed in its duty and obligations to restart the Sunset Limited east of New Orleans, and has constantly failed during the entire existence of Amtrak to make the Sunset Limited a daily train between Los Angeles and New Orleans (And Orlando when the train ran its full route.). In the real, non-Amtrak world, this group should never have been necessary. If Amtrak had the compunction to live up to its mandate as a national rail carrier, there would be no discussion about the gaping hole in Amtrak’s route map between New Orleans and Jacksonville. An entire region of the country is disenfranchised for passenger rail service because Amtrak isn’t clever enough to figure out how to make the Sunset a success. So, a group whose membership is more than 50 souls is working together to take the place of a taxpayer funded organization’s planning department to figure out how to make the Sunset Limited viable. Amtrak should be terribly embarrassed. 1) If you are an airline, which pays landing and takeoff fees, plus user fees at every airport, plus user fees for the federal and international air traffic control systems, you make the most money operating long haul flights, preferably international long haul flights. As an airline, you stuff as many passengers as will fit in a tiny, tiny space known as “coach” class, and you make sure everyone knows you’re giving them peanuts, allegedly because so many people are allergic to peanuts and they don’t know it. You sell these people their “meals” and drinks, and hope many passengers purchase alcoholic beverages because you make a fortune from them, but – at the same time – don’t want any particular passenger to purchase too much and become drunk and disorderly. Up front in the aircraft, you have first class and business class passengers, who willingly pay huge extra dollars for larger seats, better food (which is included in the price of the ticket), and a higher level of service. On the long, profitable, overnight international flights, if you are a foreign flag carrier, you now provide something of a cocoon for seating, which has all sorts of technological gadgets and a slightly heightened sense of privacy as the space converts to what allegedly passes for sleeping space. You operate some short haul flights to feed your profitable long distance flights, but, in as many cases as possible, you take advantage of smaller, more efficient commuter airlines to feed your long haul flights. Sometimes these feeder airlines operate under your name using your reservations system, and sometimes they operate under their own names. Either way, the more expensive, short flights feed your true money-making long haul flights. If you are a cruise line, which pays docking fees every time your ships are connected to land in any way, plus government inspection fees, plus all sorts of other interesting, yet, arcane taxes no one knows about, you have several classes of passengers on your huge ships, most of which host over 2,000 passengers per sailing. Way down below the water line, next to the engine room, you have “economy” class interior “staterooms” (really, large closets with bath facilities and no windows) which provide cruise passengers with a place to sleep, bathe, and change clothes. You do provide these passengers with at least four major meals a day (including the always popular midnight buffet), and several small meals a day, all included in the price of your ticket. These same passengers are highly encouraged throughout the days at sea to purchase expensive alcoholic beverages, gamble in the onboard casino, shop in the gift shops, and pay lots of money for shore excursions. The higher you go on the ship, the more expensive the accommodations, the more money the cruise line makes, and the more affluent passengers through very high fares for cabins with balconies, subsidize the passengers traveling in interior cabins next to the engine room way down in the bowels of the ship. And, then, there is Amtrak, which is determined to never understand any of the economics of passenger travel, and do things as expensively as possible, with the lowest possible return on investment, and the least ability to create an enterprise which can support itself. Just like the airlines and the cruise lines, Amtrak pays a user fee to its host railroads for use of tracks and dispatching; in fact, this fee is so small and so below market, it’s almost a crime the host railroads don’t make a better return on their investment for their privately owned infrastructure, which Amtrak uses for next to nothing. Amtrak runs 15 long distance routes throughout the country, and feeds those routes with 26 short distance routes. The 15 long distance route generate 2,609,387,000 revenue passenger miles, and the 25 short distance routes in comparison generate only 1,754,039,000 revenue passenger miles. Here is what Amtrak brags about, but really doesn’t matter. The long distance routes carried 4,170,300 separate passengers, and the short distance routes carried 13,605,800 passengers. Wow! Amtrak will tell you; look at how wonderful we are because we carried all of those people. Who cares? The average length of trip of a long distance passenger was 625.7 miles, and for short distance passengers it was only 128.9 miles. Which passenger would you rather have? The long distance passengers coughed up total revenues of $416,284,100, while the many more short distance passengers spent $362,294,100. Whoopee. Amtrak’s short distance trains would be fine if there was enough capacity and enough long distance routes to carry more passengers. But, as we have seen in the recent reports issued by Amtrak for restoration of long distance service east of New Orleans and for the Pioneer route, Amtrak has little – if any at all – enthusiasm for long distance trains. To back this up, one only has to look at Amtrak’s business plan. Whoops! We can’t do that, because Amtrak doesn’t have a business plan; it only has an indication it is more interested in taking money from states for short distance trains than for expanding the long distance network. Amtrak’s short distance trains – little more than a series of Greyhound busses on steel wheels hooked together – are expensive to operate, and, as we see above, don’t generate nearly the transportation output of the long distance trains. But, Amtrak loves body counts, so it likes to brag how many individuals step onto an Amtrak train. This, of course, doesn’t matter, because 1,000 passengers only traveling 10 miles doesn’t mean nearly as much as 100 passengers traveling 150 miles each. Any rational manager will always take the 100 passengers traveling 150 miles because you get a much better return on investment and actually accomplish more good. Moving 1,000 passengers 10 miles is a job for transit or commuter services, not intercity rail passenger trains. It was all of the freight railroads’ big city and regional commuter services – such as those of the Pennsylvania Railroad, New Haven Railroad, Chicago Northwestern, and many others – which ultimately led to the downfall of private passenger service, because by federal regulation the railroads had to run those trains (at huge losses) and the dwindling long distance trains trying to compete with the new glamour of jet aircraft and new, four lane Interstate highways with Holiday Inns could not cross-subsidize the commuter services. If Amtrak had not been created, and at the same time the Staggers Act had deregulated the railroads as it did a decade after the creation of Amtrak, and the railroads could have found a way to shed their expensive branch line passenger milk runs and various commuter services, there is more than half a chance private passenger rail would not only have survived, but eventually flourished as it has the opportunity to do so today. Had Amtrak not been created and the railroads deregulated, there probably would still be a healthy rail passenger car building business in this country, a much stronger national network of long distance trunk line trains, and CSX would be running stainless steel silver trains in and out of Florida and Union Pacific would be running armor yellow trains with red striping in and out of California. Had deregulation happened in the Nixon Administration instead of the Carter Administration, it’s quite possible the railroad corporate map would be very different today, because many of the mergers which took place merely for corporate survival may have been put off, or never have occurred if deregulation had happened and the free market place had acted a decade or more earlier. But, well, today we do have Amtrak, a company which doesn’t seem to want to bestir itself for much more other than its annual begfest for funding on Capitol Hill for more and more free federal monies. Perhaps Amtrak’s apathy is because it seems to be a company at war with itself. It has an interim president and chief executive officer who refuses to speak with the news media. It has a general counsel who seems to think Amtrak – and, herself – are pretty much above the law. It has an interim inspector general who is totally unqualified to hold the position. It has a chief operating officer who is obviously loyal to the guy who hired him – two Amtrak presidents ago (three if you count one other short term interim who was forced out, too). A new board of directors is forming. The White House announced two appointments to the board this week, and there are still two vacancies to fill. We have a new FRA administrator who serves on the board, too, and whenever a permanent Amtrak president is named, he/she will also be a board member. It’s time to clean house. Give some of these good people at the top of Amtrak who want to do better the ability to do that. Get rid of the deadwood, and all of the folks with the old allegiances, and replace them with a new, dedicated team that wants to succeed, not merely survive until retirement. Give somebody – and Amtrak – a fighting chance. If Amtrak keeps going much long the way it is going today, the bankruptcy of New York City back in the Ford Administration is going to look like a romp in the park. Amtrak is also headed down the nearly identical path of the inglorious Penn Central Railroad, which, at the time, created the Enron financial disaster of its day in the last half of the 20th Century. The only way Penn Central eventually was saved and turned into a profitable Conrail was to get rid of so many of its internal antagonists and start with a fresh group of people. Amtrak needs to do that right now, before it becomes as helpless as Penn Central did so many years ago. 2) As promised, and promised, here’s William Lindley of Scottsdale, Arizona. Let's look at one scenario for creating the full matrix of passenger trains in the United States. Please understand, the continuation of much of the existing "long distance" train network is helpful, but not required, for this scenario. A single daily train handing a handful of passengers at each station is very close to an irrelevancy compared to the volumes the eventual network will create. We begin with perhaps a half-dozen local turnkey train operators. Each of these would be, at the beginning, in a fairly sizable region of the country and attached to a single Class I railroad, acting as a single point of contact between the railroad and the governmental agencies for all services. The local trains act as the catalyst to bring cities and towns, large and small, on board with modern passenger rail. Providing local service gives direct benefit to monies spent rebuilding local stations, upgrading rights of way, eliminating grade crossings, and generally providing the "terminal services" that the later express and limited trains will require. The goal with the first phase is to begin laying groundwork so that, as in Europe, when a train leaves the station it can accelerate directly to full speed without creaking through miles of ancient switchwork. Once these local trains have built political support through an expanding ridership base, express services will be added on longer routes, between the major cities... gradually connecting the matrix of local trains. Then the limited trains, on much longer routes, will be upgraded and dramatically expanded from whatever "long distance" trains still exist. First, line up an equipment manufacturer – Bombardier, Talgo, or US Railcar which is planning to start building on the former Colorado Railcar's DMU production plans. Second, bring aboard an insurance company which is willing to work with the railroads. Then, select one of the Class I railroads – and only one – to start with. It is this single railroad with whom you will be a single point of contact. Indeed, it might be beneficial to have a five-year exclusive agreement that "all commuter and short-distance passenger services" on their lines be provided through such a single point of contact. Finally, and only after these are all at least tentatively aligned, go to the states, counties, and municipalities all along the one carrier's lines. Each region will have different needs – from sidings and double-track, to restoration of missing segments, to grade crossing and station issues; but every city will be getting a uniform and well-understood arrangement. In short, this sort of turnkey operation benefits both the railroads and the cities. The basic plan for the turnkey local operator in each region is to start with two trainsets, offering three or four daily round-trips. Service will provided not just into destination downtowns, but, to the suburbs on either side, and to most every town of any size along the route. These are true basic transportation, local trains. And they will act as feeders – the base matrix – to the express and limited train networks which will follow. Generally these first trains will run on routes of between 150 and 200 miles, either centered on one large city or between two cities, with one-way times of about three to four hours, and about a dozen stations. Each trainset will operate about sixteen to eighteen hours a day, maximizing return on investment while permitting sufficient time for servicing. In the Tampa, Florida, metro area, two trainsets could provide four daily round-trips. The first train from St. Petersburg could leave at 6:30 A.M., arriving Tampa at 8:05 and Sarasota at 9:45; the first train from Sarasota leaving at 6:30, arriving Tampa at 7:55 and St. Pete at 9:45. The first three trains would leave each terminus every four hours on a "memory schedule" with the exception that the 2:30 P.M. trains, which both would arrive Tampa at about 4 P.M., would wait there an hour until a little after 5 P.M. for the evening rush; then the last trains would depart each terminus at 7:30 P.M. Each train would stop at Pinellas Park, Largo, Clearwater, Oldsmar, Carrollwood, and Sulphur Springs west of Tampa, and Gibsonton, Apollo Beach, Ruskin, Palmetto, and Bradenton on the way to Sarasota. Total population of these is over 950,000. Today's Silver Star calls at Tampa at 12:34 P.M. southbound and 2:17 P.M. northbound, and these local trains would provide excellent connections in all directions. 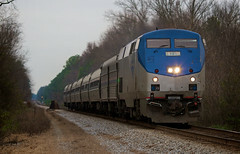 In Georgia, Atlanta and Macon are less than a hundred miles apart, so four or five daily round-trips should easily be made with two trainsets. Indeed the initial local route should at least connect Warner-Robins, south of Macon, with some of the suburbs beyond Atlanta. Atlanta is an excellent connection point, if a train station at the Five Points MARTA subway stop can be constructed – MARTA acting as the local feeder. These local trains would then serve commuters as well as all-day regional travel. Later, express service to Chattanooga to Savannah would overlay these local trains, followed by a further overlay of limited-stop service from Chicago via Indianapolis and Louisville to Florida. Similar opportunities exist all across the country. Duluth to Minneapolis. Green Bay to Milwaukee. Anywhere there are cities under 150 miles apart is a prime candidate for comprehensive local train service. Again, first we bring the states, counties, and cities on board with three or five daily trains that serve not just commuters, but, tourists and residents all day long. Much needs doing to upgrade the existing tracks, signals, and bridges to accommodate relatively fast passenger trains along with today's freight trains; much needs doing to restore stations, station tracks, and re-integrate the passenger train facilities with today's bus, streetcar and subway networks. The improvements made possible by the local trains is what makes the later express and limited trains work smoothly. By building ridership and political support, all is possible. – Office hours are from 2:10 A.M. to 2:25 A.M., Sundays, Wednesdays, and Fridays. – He knows the more patients he sees, the more money he loses. – You'll have to ride an hour on a bus to the middle of nowhere, because the downtown location was closed "to save money." – Everything takes longer than it did in 1951, and the furniture looks it. 4) And, this missive from a TWA reader. I'm glad that others share my view on letting other companies operate long-distance routes in this country. Even though a lot of people in the rail community are (deservedly) excited about the aspect of high speed rail coming to their states, they should also remember competition also applies to the long-distance trains as well, and pressure needs to be kept on Amtrak. After reading some of the more recent TWA articles, it's obvious to me certain people in Amtrak's management need a wake-up call (Whether it's by losing out on the majority of the HSR corridors, or by watching some of its long-distance routes return to the freight railroads, something big needs to happen to shake them up.). After all, the poorly handled Sunset Limited report, a failure to drastically upgrade the overnight fleet, and demanding states to pay for long-distance routes have all happened on their watch. Now, with all the talk about whether Amtrak is really disinterested in operating long-distance trains in the long-term, why don't some of the friendlier host railroads contemplate bidding for some of the overnight routes? Pullman may be gone, but the hosts could talk to a manufacturer like the revived Colorado Rail Car company about acquiring some real dining cars and sleepers. At last year's Railway Age conference, railroad author Frank Wilner advocated returning intercity passenger trains to the freight companies because he thought “a sound business model” would win over anti-Amtrak politicians in Congress (Source: January 2009 Railfan & Railroads). While it sounds tempting, I’m not sure all passenger routes can be returned to the host railroads. Instead, I propose the hosts talk to the likes of Herzog, First Group America, and some of the foreign bidders for HSR and get them to run the trains. I would definitely like to see routes like the Crescent and Silver Star be supplemented with daytime counterparts so I don't have to go from the Carolinas to Atlanta or Florida in the middle of the night. The hosts would work out a three or four-way partnership with each other and the new entity operating the route (for example, a daily Sunset Limited could have an agreement with BNSF, CSX, Union Pacific, and First Group America) as a way of avoiding the problem of changing trains. Meanwhile, BNSF could run the Southwest Chief by itself and add routes and branches like a spur to Phoenix (a similar situation would apply to Norfolk Southern with the Crescent). One more thing, the Auto Train concept could be added to other markets by the host railroads (after all, those empty auto racks currently seen on freight trains could be very useful). It may not have been feasible to have a Midwest-Florida Auto Train route 26 years ago, but if gas ever returns to September 2008 levels, it would be more than practical for the Auto Train concept to be extended to other parts of the country. P.S. Based on the discussion in the URPA Intranet group during the Labor Day weekend, states like Florida should contact Veolia or any of the companies which fail to get HSR bids to operate conventional speed routes as a precursor to high speed service. This latest Pioneer (a splendid route serving "rich pickings" territory, lots of greens, etc) issue reminds us that Amtrak sees itself not in the passenger service business at all, but, as a candid porter once told me, as a "jobs program." Sad to say, that's the kind of people you have "managing" it, though "managing" is probably the wrong word. "Showing up at the office to get the benefits and the pension" is more like it. Pity a private operator can't pick this one off. Always value reading your (depressing) reports. The Mid-Jordan TRAX line is a 10.6 mile light rail line connecting the communities of Murray, Midvale, West Jordan and South Jordan with the existing Sandy/Salt Lake TRAX line. It runs from the existing TRAX line at 6400 South to approximately 7400 South, then turns west along the Bingham Branch of the Union Pacific Railroad. At 5600 West, the line turns south again and ends at the southern end of the Daybreak development. For construction purposes, the line has been segmented into five sections. The map below shows each section in a different color, beginning with Daybreak on the southwest end and ending with Cottonwood at the northeast end. Crews are currently installing the station platforms and the overhead catenary (power) systems in the Daybreak area. Curb and gutter work as well as paving continues at the Park and Ride station near 4800 West. NEW Activity: Drainage work. Traffic Impacts: Old Bingham Highway will be closed at 9000 South to accommodate drainage work on 10/21-10/23 (Wednesday-Friday). 9000 South will remain open. UPDATED Activity: Paving at 9000 South and the trackway located near Old Bingham Highway has been delayed due to inclement weather. Traffic Impacts: 9000 South will be subject to lane shifts through the week of 10/12 to accommodate paving opportunities. Additionally, Old Bingham Highway will be closed during paving. UPDATED Activity: Roadway reconstruction near Old Bingham Highway (approximately 9400 South). Traffic Impacts: 4800 West will be subject to a lane shift near Old Bingham Highway through 10/10 (Saturday) to accommodate crews working in the shoulder. UPDATED Activity: Bridge work over Bangerter Highway (approximately 8700 South). Traffic Impacts: Bangerter Highway will be subject to a one center lane closure in each direction 10/14- 10/16 (Wednesday-Friday). Activity: Traffic signal foundation work. Traffic Impacts: Old Bingham Highway at 5200 West will be subject to a traffic shift through 10/2 (Friday) to accommodate crews working in the shoulder. Activity: Bangerter bridge median restoration. Traffic Impacts: The median on Bangerter Highway near the bridge at approximately 8710 South remains closed through October to accommodate median restoration work. Crews are working in the next few weeks to finish the soundwall between the Utah/Salt Lake Canal and 2700 West. NEW Activity: Waterline installation work along 2700 West near the trackway. Traffic Impacts: 2700 West will be closed at the trackway on 10/31-11/1 (Saturday-Sunday). Additionally, 2700 West is subject to periods of one lane restrictions with flagging operations through 10/23. NEW Activity: Utility work. Traffic Impacts: Redwood Road at approximately 8000 South will be subject to two outside lane closures in each direction on 10/10-10/11 (Saturday-Sunday). One lane in each direction will be open in this area. Sidewalks will also be closed during this time for safety reasons. Please plan accordingly and use an alternate route. UPDATED Activity: Shoulder work. Traffic Impacts: Jordan Valley Way near the tracks may be subject to lane shifts to accommodate crews working in the shoulder through 10/25 (Sunday). Please use caution when driving through the construction zone. Activity: Please be aware that flagging operations will be taking place intermittently through 2009 at 2700 West near the tracks to accommodate construction vehicles; please follow flagger’s instructions. Activity: Please be aware that flagging operations will be taking place intermittently through 2009 at 3200 West near the tracks to accommodate construction vehicles; please follow flagger’s instructions. Work on the bridge at 700 West continues through the month of October. NEW Activity: Girder delivery on bridge over 700 West at approximately 7400 South. Traffic Impacts: 700 West will be closed at 9 pm on 9/21 (Wednesday) through 3 pm on 9/23 (Friday) to accommodate girder delivery. NEW Activity: Bridge work. Traffic Impacts: Crews will be working on structures at the base of the bridge piers on 700 West and approximately 7400 South. Please be aware that the 700 West will be subject to lane shifts in this area through 10/31 (Saturday), except on 10/17-10/18 (Saturday-Sunday). Activity: Rail crossing at east 9th Avenue (approximately 7100 South and 600 West). Traffic Impacts: Traffic on 9th Avenue will be subject to one lane with stop signs through 10/10 (Friday). Please use caution at this crossing. UPDATED Activity: Girder delivery and pier base work on bridge over 7200 South at approximately 600 West. Traffic Impacts: 7200 South will be closed between the I-15 southbound off-ramp and 700 West from 10 pm to 7 am daily, 9/23-9/25 (Friday-Sunday). Additionally, the median will be closed 9/26-9/30 (Monday-Friday) to accommodate pier base work. Activity: Construction on the Jordan River TRAX bridge. Traffic Impacts: The Jordan River Parkway Trail near approximately 7500 South will be intermittently detoured through October 2009. Please be aware that the detour does cross a live railway track and will be closed daily from 7:00 p.m. to 7:00 a.m. when freight is actively running on the track. Access to Gardner Village from the Jordan River Parkway Trail is closed until further notice. UPDATED Activity: Girder delivery and pier base work on bridge over 7200 South at approximately 600 West. Traffic Impacts: 7200 South will be closed between the I-15 southbound off-ramp and 700 West from 10 pm to 7 am daily, 10/23-10/25 (Friday-Sunday). Additionally, the median will be closed 10/26-10/30 (Monday-Friday) to accommodate pier base work. Crews are currently forming and pouring the concrete walls for the portal in the Cottonwood Area. UPDATED Activity: Handrail installation. Traffic Impacts: Winchester Street will be subject to one-lane restrictions with flagging operations 10/20 (Tuesday) and 10/21 (Wednesday) for safety. Reach Description: Reach 1 is the area along Constitution Boulevard (2700 West) from West Valley City Hall at 3600 South extending north to 3100 South. This area includes both large and small businesses, as well as many residents. Access to all businesses and residences will be maintained. · Crews continue to form and pour concrete near the station platform at the West Valley City Hall. · Significant work has taken place on the curb, gutters and driveways on the west side of Constitution Boulevard. · The west side of the roadway on Constitution Boulevard is scheduled to be paved mid-October. · After the west side is paved, traffic will be switched to the east side so it can be top paved. · Crews will begin to work on the track on Constitution Boulevard between 3100 South and 3500 South in mid-October. · Traffic on 2700 West between 3100 South and 3500 South is operational on the east side of the road. Please be mindful of construction crews and obey posted speed limits. · Watch for “Business Access” signs on the west side of Constitution Boulevard. All businesses are open and access is being maintained. Reach Description: Reach 2 is the area along 3100 South from Constitution Boulevard to Decker Lake Drive. The E Center and businesses are located in this reach, as well as residents on either side of 3100 South. Access will be maintained and we will work with the E Center to coordinate our efforts so you can continue to visit the great events they have to offer. When TRAX is completed along 3100 South, it will operate on the south side of the roadway. Current Construction: Crews continue to build the TRAX bridge approach between Maple Way and I-215. Work also continues on the actual bridge crossing I-215 south of 3100 South. · Nighttime construction is taking place on the TRAX bridge over I-215 on the south side of 3100 South. Noise impacts are anticipated to be minimal during nighttime work activities. Residents are encouraged to call the 24-hour hotline number at (888) 800-8854 with questions or concerns. Reach Description: Reach 3 is the area along Decker Lake Drive from 3100 South to Research Way (2770 South) and east to Redwood Road. This area includes many commercial office buildings with thousands of employees who access this area on a daily basis. We will continue to work with businesses to ensure access is maintained. · Decker Lake Drive is now closed for three months to accelerate the TRAX construction schedule. Access is being maintained through the detour listed below. Businesses are encouraged to call the hotline at 888-800-8854 if issues arise. · Sidewalks will be paved on the east side of Decker Lake Drive beginning mid-October. · Construction is currently on schedule in this area. · Utility work is scheduled to begin on Research Way in mid-October. More details will be available in the next weekly update. Traffic Impacts: Please see the above listed detour implemented during the temporary closure on Decker Lake Drive. Reach Description: Reach 4 runs through the Chesterfield residential area along 2770 South and proceeds along the Decker Lake Canal and the Crosstowne Trail. We will work with residents to ensure a safe working environment and access to their properties throughout construction. Current Construction: Significant work has been accomplished in the Chesterfield area. Crews continue to work on the rail and other items. · Water line work continues on the east side of 1070 West. Upcoming Construction: After utility work is complete, crews will begin work on the curb, gutter and roadway on the west side of 1070 West. Construction is anticipated to take place for the next several months. · Significant progress continues on the TRAX bridge structures over the Roper Yard area near 2200 South and 600 West. Crews are currently installing the bridge girders. · Crews also continue work of the TRAX bridge approaches on either side of 900 West just south of SR 201. Construction is proceeding just east of 900 West along the south side of SR 201. Currently there are no traffic impacts on 600 West. Current Construction: Roadway construction is currently underway along Andy Avenue. We thank businesses for their support during this phase of construction. · Roadway work will continue on Andy Avenue throughout the next few weeks as crews work on the guide way excavation. · Progress is also being made on the TRAX bridge approaches on either side of 600 West. Upcoming Construction: Heavier construction is anticipated Summer 2010. At times there will be a right lane restriction along Bangerter Highway just north of the I-80 off ramp entering the airport. Minimal delays should be expected. Work continues near 2400 West as crews stabilize the soil and clear a path for TRAX. Crews will begin work on the storm drain near the Surplus Canal beginning Monday. Access is being maintained throughout work areas. Please obey posted speed limits. Current Construction: Currently, TRAX construction is not taking place in Reach 3. Traffic Impacts: Currently, there are no traffic impacts in Reach 3. Upcoming Construction: Heavier construction is anticipated beginning Spring 2010. Traffic Impacts: Currently, a water line is being replaced on the south side of North Temple from Redwood Road to Orange street. This work is not associated with the Airport TRAX project. Construction on the Jordan River Bridge began on September 27th. Crews will construct the bridge one half at a time to maintain one lane of traffic in both directions. This work is expected to take place for approximately eight months. Demolition began on the Jordan River Bridge on October 1st and will continue through mid-October. Crews will begin to drive pile for the Jordan River Bridge after demolition is completed. Current Construction: Traffic management extends into Reach 6 due to work taking place on the Jordan River Bridge. However, access is being maintained. Upcoming Construction: The majority of heavier construction is anticipated Spring 2010. Reach Description: Reach 7 is the area where the Airport Line will connect with the current north/south TRAX Line at the Arena Station. This reach extends from I-15 to 400 West along North Temple and turns south on 400 West to South Temple. Access to offices and the Gateway will be maintained. Crews are “potholing,” or exposing underground utilities, to determine horizontal and vertical locations. Traffic Impacts: During pothole operations expect minor lane restrictions. Below is the FrontRunner South construction update for October 10 – 16. To learn more about the FrontRunner South project, click here. Work continues on the bridges over eastbound and westbound I-215 and is nearing completion on the bridges over Center Street (7800 South) and Wasatch Street (8000 South) in Midvale. At the westbound I-215 bridge crews will be forming, tying rebar and pouring concrete for a pier footing, and at the eastbound I-215 bridge crews will continue installing slope paving. At Center Street crews will finish installing handrails on the bridge and repair the sidewalk under the bridge, and at Wasatch Street crews will place a power pole. On Wednesday and Thursday at Center Street the southern eastbound lane will be closed due to truck traffic in the area. Flaggers will be directing traffic. Work on the walls at the flyover bridge continues this week as does work at the box culvert at Willow Creek, north of 123rd South in Draper, where crews will continue installing corrugated metal pipe. From 123rd South to Bangerter Highway, crews will clear and grub the corridor, begin embankment work and hydro seed the slope. There will be truck traffic with flaggers directing traffic at 10000 South in South Jordan and on the west side of the 144th South bridge in Draper. South of 146th South in Bluffdale, crews are removing material from and near the corridor and transporting it to other areas in the corridor. Work will also continue on a post and panel wall north of Clubhouse Lane and on the soil nail slope for a wall at Clubhouse Lane. Crews will be hydro seeding a cut slope between Clubhouse Lane and 2100 North. At the 2100 North bridge in Lehi, crews will continue installing temporary shoring and begin forming and tying the south abutment. And at Dry Creek, near the Lehi Rodeo Grounds, crews will construct the box culvert, pour concrete for the culvert’s closure and continue power relocation. There continues to be truck traffic with flaggers near 500 West and 300 North in Lehi. Crews continue landscaping, sign installation and road striping at the Lehi Station Park and Ride Lot this week. In American Fork crews will continue water line relocation and a casing extension at 200 South. From 5200 North to 400 North, crews will continue sub grade prep, chain link fence installation and sub ballast placement. And between 400 North and Geneva Road, crews will begin sub grade prep, install cross drains, place sub ballast and continue installing reinforced concrete pipe. Utility work will take place near the American Fork Park and Ride Lot and at 200 South all week; there will be lane drops with flaggers directing traffic. Utility work will also take place on Monday at 1100 South on the southwest side of the tracks and there will be truck traffic with flaggers at 1500 South/ 6400 North in American Fork. Crews will continue storm drain and electrical conduit work and landscaping at the American Fork Park and Ride Lot as well as clear and grub the sub grade. Significant progress has been made in Area 10 along the Union Pacific Railroad corridor between University Parkway in Orem and West Center Street in Provo. Crews have prepared a path for FrontRunner by grading and clearing the right-of-way and relocating water lines. Drainage and irrigation installations are generally complete in this area, and main line earthwork has been finalized from University Parkway to 2000 South in Orem and from the Provo River bridge to 500 West in Provo. Crews will construct track between University Parkway in Orem and 2800 West in Provo, and distribute ties between 1680 North and I-15 in Provo. At the Provo River bridge, crews will install H-pile for one of the abutments. Crossing work continues in Provo with crews finishing up landscaping at the 700 West crossing and beginning safety enhancements at Freedom Boulevard. Work at Freedom Boulevard will include signal and track work, the installation of concrete medians and signs, road striping and curb and sidewalk replacement. There will also be lane drops as needed while crews finish landscaping work at 700 West and the crossing will be closed at Freedom Boulevard to accommodate crossing upgrade work. 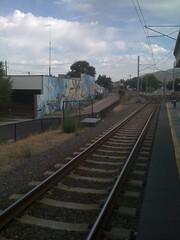 Crews will continue work on the stem wall at the Provo Station.